START YOUR DISRUPTIVE CHANGE MAKER JOURNEY TODAY WITH OUR 6 MONTH SELF-DIRECTED CERTIFICATION TRACK COVERING THE ENTIRE DISRUPTIVE DESIGN METHODOLOGY SET AND ACTIVATING YOUR AGENCY FOR POSITIVE CHANGE. This self-directed learning experience is a 6 month program designed to activate your agency in creative change making through the Disruptive Design Method (DDM) core content and agency building skills. Each month you get curated learning content laid out in a progressive learning experience that covers all of the DDM core content, along with challenges and points program. This program is designed for passionate people wanting to make a positive impact in their professional career and personal lives. It runs through all of the core knowledge areas of the Disruptive Design Methodology and teaches you the practice of positively disruptive change making. This is a great starting point if you are new to thinking in systems, sustainability and design. 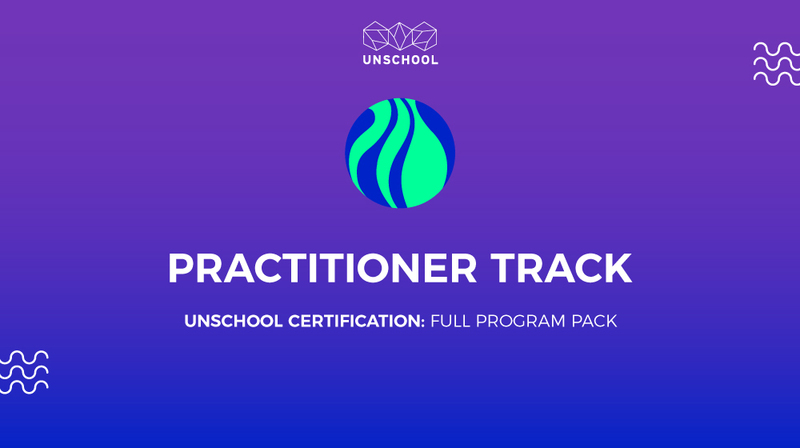 The Practitioner Certification Track is 6 months with content delivered at the start of each month. You will have 3 months after you complete the 6 months to submit all your content to challenge for the certification. Anyone interested in making a positive impact on the planet through systems, sustainability and design. You can sign up for additional office hours to get one on one time with our UnSchool educators to support your learning process. Sure, check out week 1 below to get some sample content. We also offer 30-day money back guarantee, no questions asked. If you don't think it's rights for you then we will refund your first month's payment (minus administrative fee) if you let us know within 30 days. Please read the terms and conditions carefully. Certification is provided by the UnSchool. Upon completion of all the required materials and the submission of the challenge pack at the end of the 6 month program, your materials will be reviewed. If you have provided the documentation to demonstrate successful completion and skills, you will be awarded with a Practitioner Certificate Please review our full terms and conditions for more details.